Porgy and Bess was written by George Gershwin, with libretto by DuBose Heyward and Ira Gershwin, in 1935. It was based on DuBose and Dorothy Heyward’s play Porgy, which was itself adapted from DuBose’s eponymous novel of 1925. Set in South Carolina in the 1920s, it explores the lives of the African American residents of Catfish Row, a fictitious place on the waterfront of Charleston. Here, Porgy is a disabled beggar while Bess is the lover of Crown, a tough stevedore. Crown ends up murdering another resident, Robbins, in a dispute over a craps game and then runs away. Bess, left alone, pounds on all of the doors in the row but the only person to let her in is Porgy. Porgy and Bess fall in love, with Bess claiming she is now respectable and changed, but there is always the risk she will take ‘happy dust’ and revert to her old ways. At a picnic on Kittiwah Island, Crown, who has been hiding there, finds Bess and expects her to stay with him. When she refuses he prevents her from returning on the boat with everyone else, and degree by degree her resistance to him lessens. She makes it back to Catfish Row a few days later, delirious with fever. Things come to a head when Crown reappears, having swum from Kittiwah Island, which eventually leads to Porgy killing him. Porgy is imprisoned for a short period for refusing to co-operate with the authorities, and he returns to discover that Bess has succumbed to the charms and promises of the dope peddler Sportin’ Life, and run off to New York with him. The ending, nevertheless, has an upbeat feel as Porgy resolves to follow her there, thus revealing a triumph for optimism as Porgy proves to himself he is the man he had always feared he could not be. The opera is really, however, about the Catfish Row community as a whole, and, since it makes many of them out to be cheats, drug takers and murderers, has undoubtedly been controversial. It has been accused of being racist and of painting stereotypical images of African Americans, especially since George and Ira Gershwin, although the former did visit Heyward’s native Charleston as a part of his research, were ultimately writing as outsiders. 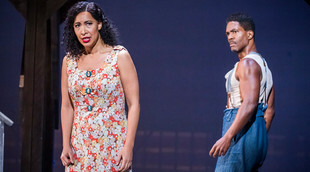 There have been many versions of Porgy and Bess with London, even only in recent years, having enjoyed the Nunn adaptation of 2006 and Paulus adaptation of 2011. As a rule, these have tended to cut the running time, replace much music with dialogue, simplify several (inconsequential) plot points, and make the entire creation feel more like a standard piece of musical theatre. However, while both have many merits, they tend to make the piece seem too light when it needs to feel like a long, gritty haul in order to help us appreciate the hard lives that the characters lead. James Robinson’s new production for English National Opera, the first ever of the work in its history, delivers something far closer to Gershwin’s original, and in the process really gets under the skin of the work. Full orchestral forces are brought to bear under the baton of John Wilson, and, with an extremely strong ensemble cast, musically the evening is something special. Visually too the performance is striking as Michael Yeargen’s set and Donald Holder’s lighting are highly evocative. The dwellings of Catfish Row are represented by skeleton structures so that we see the beds and furniture inside them, thus enabling us to gain an all-round sense of the community. The structure also proves immensely versatile as it can be revolved, or sections of it pulled in different directions, so that for Kittiwah Island an entirely different area is created. The production does not, like many, introduce additional trained dancers to provide further dynamism, and there are consequently occasions when numbers feel undercharged as if they are being left to cruise in third gear. However, the approach of employing so large a chorus, which also helps to ensure it sounds tremendous, is far closer to Gershwin’s original vision, while the base standard of dancing among this chorus is as high as any. Dianne McIntyre’s choreography also works well with the grain of the presentation so that ‘I ain’t got no shame’ sung on Kittiwah Island leaves its own impression by having everyone adopt a stylised pose for several seconds before moving to another. The cast is outstanding as Eric Greene, with his strong baritone and presence, excels as Porgy and Nicole Cabell’s soprano proves just as intriguing as her overall portrayal of Bess. There are also excellent performances from Nmon Ford who makes Crown more three-dimensional than in many productions, Latonia Moore whose rendition of ‘My Man’s Gone Now’ (she plays Robbins’ wife, Serena) is deeply moving, Nadine Benjamin who as Clara sings the iconic ‘Summertime’ beautifully, Tichina Vaughn who is a memorable Maria and Frederick Ballentine who is a suitably caddish Sportin’ Life. 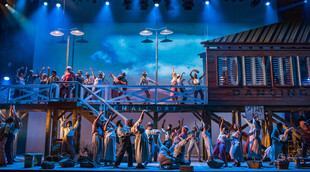 This Porgy and Bess is an asset to English National Opera as it undoubtedly will be to Dutch National Opera and the Metropolitan Opera, New York when, as a co-production with those houses, it visits them in future seasons.